I ended up at here because I wanted to feel safe. If you write enough stories about the drug cartels, people come out of the woodwork with unclear motives. Besides, I also needed a place to park both my personal car and the company car (belonging to The San Diego Union-Tribune). Most places I looked at had parking space for just one car, but this one gave me two spaces that were tucked out of the sight of car thieves. 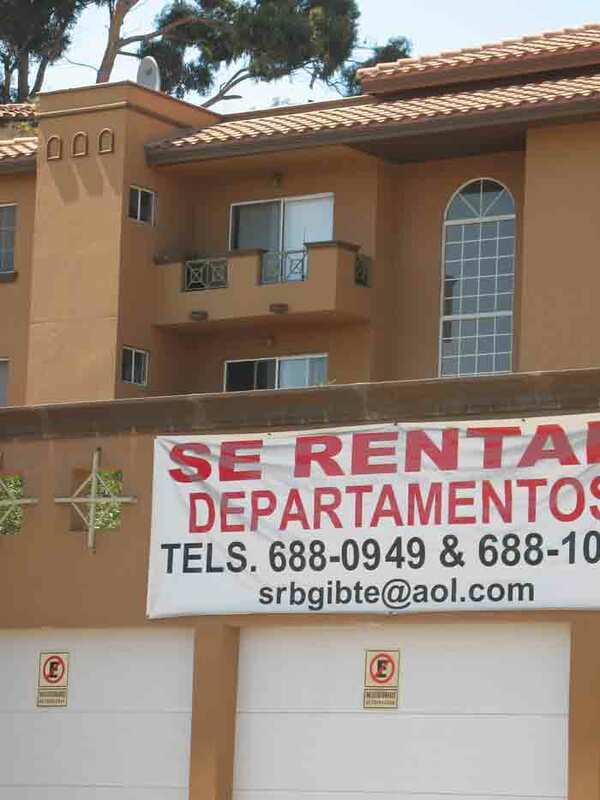 So I ended up paying about $680 a month for a unit in this four-storied condo complex, which had a light-filled atrium and a daytime security guard/handyman called Raul. 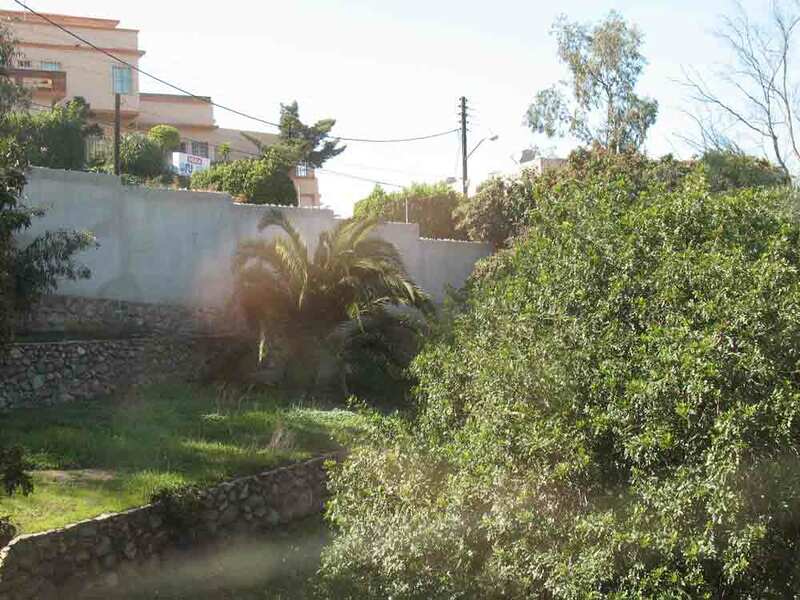 There was constant turnover in this complex, and a fair number of expensive vehicles, but most everyone who lived here kept to themselves and I was left to imagine the untold stories behind these quiet walls. Homes in Tijuana’s nicest neighborhoods homes are typically protected with fortress-like walls to keep out burglars and car thieves. The irony is that sometimes the true criminals are living inside these same protective enclaves. This past weekend, Mexican authorities detained Eduardo Arellano-Felix, who comes from a drug trafficking family that once dominated Tijuana but whose members are rapidly moving into shabbier quarters at Mexican and U.S. prisons. Looking more like a soccer dad than one of the Drug Enforcement Agency’s Most Wanted, Arellano was found in a house in one of Tijuana’s nicer neighborhoods, with his young daughter, according to The San Diego Union-Tribune. In addition to this Union-Tribune story about his detention, you can read this story in The Los Angeles Times and listen to this report by KPBS-San Diego. Two years ago the city of Tijuana announced a “sister city” relationship with Cuba’s capital in addition to the one they have had for years with nearby San Diego. I was working as a border reporter at the time, and my research led me to a Cuban restaurant that had been started by a Cuban chef and his Mexican wife. It was the only one, as far as I could tell, in this entire city of more than 1.5 million people. I’m happy to report that Sabor y Son is still open, and doing brisk business. During a recent weekend, I snacked on a Cuban-style combo plate as the place filled up with other diners eating in the small but cozy space that looks out into the street. The restaurant, which has been designed to make you feel like you are in a palapa or thatched hut, has become a sort of informal meeting place for other Cubans. In deference to local tastes, the owners make sure to provide their mostly Mexican clientele with an ample supply of chiles (which aren’t part of traditional Cuban food). An estimated 200 to 400 Cubans live in Tijuana, where they find the culture and language more familiar than life in el Norte. There’s been some recent news reports that more Cubans are crossing into the United States through Mexico, particularly in Texas. Conversely, Cuba is a popular destination for many Mexicans (who are known to pack jars of chiles for their personal consumption). Tijuana has regular flights to the island. Mexicans sometimes feel caught in the middle of the chilled relationship between communist Cuba and the United States. Mexican border states in particular are economically linked to their northern neighbor, for better or worse. At the same time, many Mexicans privately respect Cuba for standing up to the United States. You can read the original story I wrote about the Havana-Tijuana sister city relationship here. Directions: The restaurant is not in the main dining section of Tijuana. If you are going by car from Avenida Revolucion, you would go to the end of Revo where it curves left and becomes Blvd. Agua Caliente. Continue through Agua Caliente (as it becomes Blvd. Diaz Ordaz) about 10-15 minutes, passing the large hotel towers on your right. Look for the Geo municipal auditorium on your right. You will turn left at that intersection onto Blvd. Las Americas. Pass the railroad tracks and continue about two blocks. Look for the Cuban flag logo on your right. Restaurant is open 10 a.m. to 8 p.m. Monday through Saturday at #218 Blvd. Las Americas. 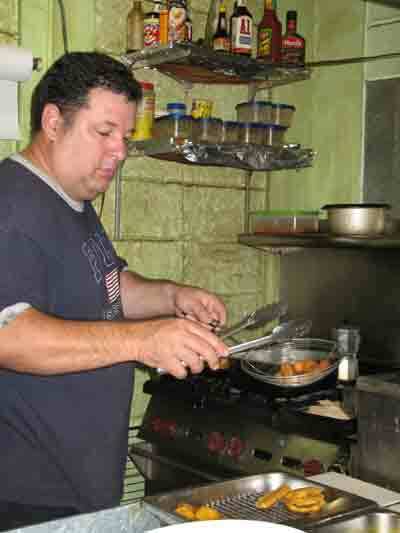 Photos: (top) Cuban chef Pedro Valdes Montero fries up some plantains. 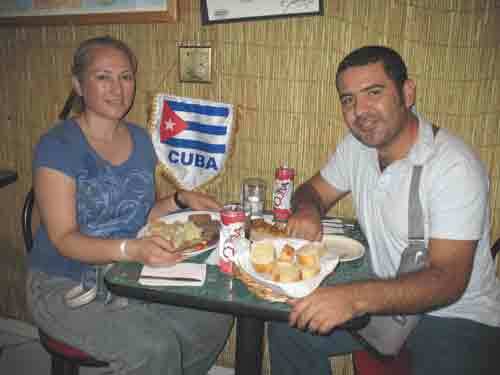 (bottom) Guests dine on traditional Cuban food at Sabor y Son. 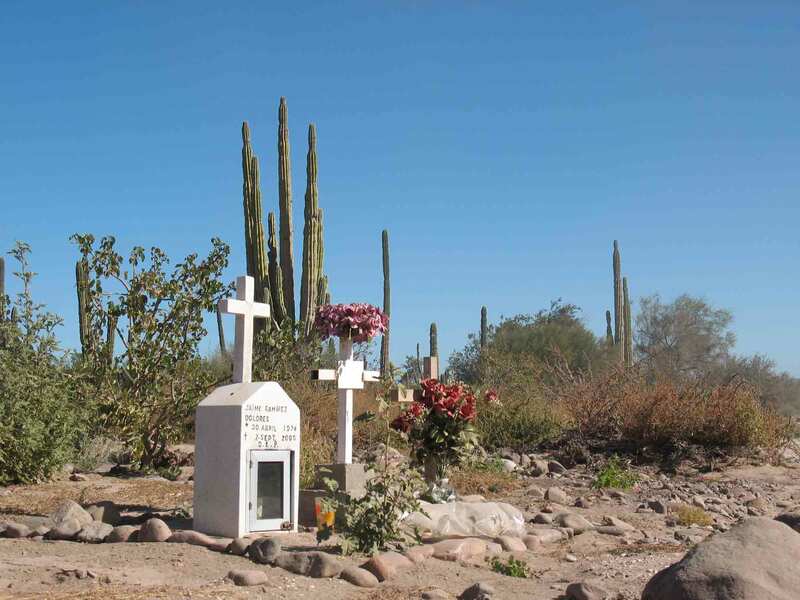 It’s time again for regular border crossers – and tourists – to navigate two time zones when the Mexico switches to from Daylight Saving Time this Sunday (Oct. 26). The United States won’t follow suit until Nov. 2. This causes all kinds of problems and surprises for people who go back and forth. The United States and Mexico used to be in synch until last year when the United States opted for a new schedule. This time around San Diego will be one hour ahead of Tijuana for one week, acording to a short but informative article in The San Diego Union-Tribune. For some interesting stories of how asynchronous time has disrupted life along the border, read this Union-Tribune story from 2007. Photo of billboard at San Ysidro border lanes. 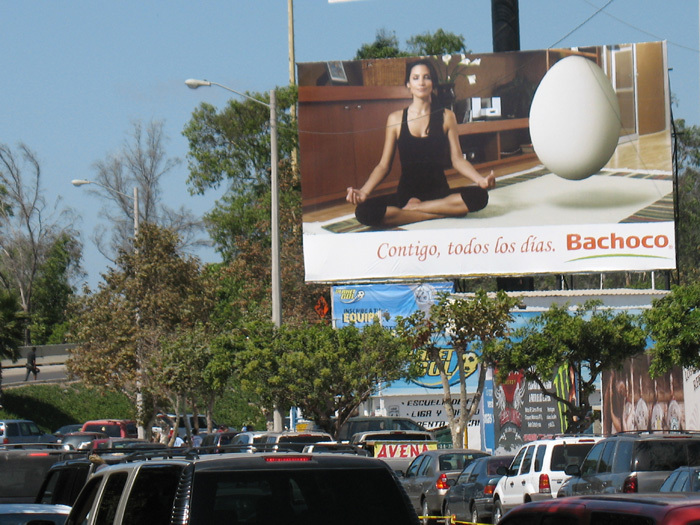 I’m not sure what an egg has to do with yoga, but I’m sure a lot of people waiting in line here can only dream of being in a state of tranquility. There’s been a lot of media attention lately about the fate of the border fence meeting area along Friendship Park, which lies just across from Tijuana. This is a section of the fence that has traditionally served as a gathering point for people on both sides of the border as an alternative to crossing the border either legally or illegally. On weekends, in particular, you’ll find families sharing meals, conversation and kisses with just the slightest of barriers between them of mesh wire and corroded fence parts along this northwestern-most edge of the U.S.-Mexico border. The area has been the site of cross-border yoga and a human cannonball stunt (see video). That may all soon become a thing of the past. Construction is supposed to start next month on a new phase of fence construction that will essentially eliminate the get-togethers along this section of the border. The San Diego Union-Tribune reported the story last month. The Washington Post and The New York Times have also both published articles on this development. For those of you who have been feeling a little wary about visiting Tijuana these days, consider this: Rick Steves just went there. Steves is a perennial traveller with his own television show and travel book series. He has traipsed all around Europe, but he admits in this Oct. 9 blog posting that this was his first visit to Tijuana. And he came here when many tourists appear to be avoiding the city due to concern over a prolonged wave of drug-trafficking violence. He apparently didn’t time his travels this way, but Rick Steves in Tijuana is probably one of the best things to happen to tourism officials here lately. (Another boost came from Mickey Mouse, who was in town this month for some park-related promotion). Steves’ visit also appears to be inspired in part by an attempt to amend a statement he made last year – equating old Tangier as the Tijuana of Africa – that some took as an unfair dig of Tijuana. Read this friendly challenge lobbed by World Hum co-editor Jim Benning. During his short stay, Steves observes the busy border scene and walks down Avenida Revolucion. He takes a city bus tour and he joins mass at the downtown cathedral. Then he repents his former bad thoughts of Tijuana over a bag of churros. In a follow-up posting, Steves muses about the drug-related violence, finds “no tension” as a traveller during his visit, and considers decriminalizing marijuana. I’m not sure Mickey Mouse would agree with Steves’ drug policy, but if these two American icons can visit Tijuana safely then that’s probably an encouraging sign for the rest of us. Photo of Rick Steves from Wikimedia Commons under Creative Commons License by author Andrew Bossi. Sometimes people use bribes to cut through what they see as unnecessary red tape south of the border. The Mexican government acknowledges this is a problem, and as part of a campaign to improve government efficiency they are holding a contest to identify the most useless bureaucratic process. 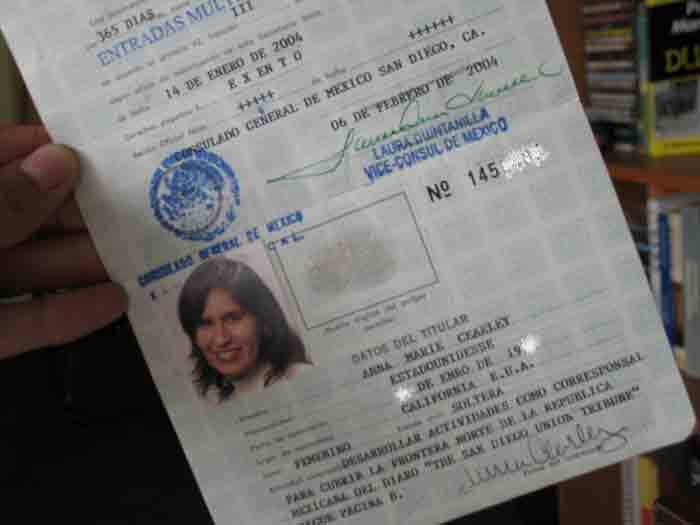 My own experiences with Mexican bureaucracy came from working as a reporter in Tijuana for The San Diego Union-Tribune. As such, I signed up for a foreign journalist FM3 visa that had to be renewed each year. I probably would have been fine without one, to be honest, but it didn’t hurt to have an FM3 when visiting military bases and proving my identity to skeptics. So each year there was the usual angst of getting together certified paperwork, thumb-sized photos, and figuring out how to pay for the renewal (one time I was told to put the money into a special bank account, the next year I was told that was absolutely not the way to do it). The system wasn’t really set up to handle correspondents outside of Mexico City so my request got handed off to various agencies. Sometimes it was the Mexican Consulate in San Diego, and other times it was immigration or press agencies in Mexico. The last year I did this, I was told to send my visa to Mexico City where it lingered for more than a month until I called to ask what was going on. I was then told I had to submit the visa through Tijuana immigration and THEY would send it to the corresponding official in Mexico City. That was the year my visa did more travelling than I did with two round-trip flights to Mexico City (and it took almost six months to get my itinerant visa back). I never considered using a bribe, but I certainly could understand the frustration some people here must feel. For more background on attempts to combat corruption and bribery in Mexico you can read this dated but still relevant story by The Washington Post. For a story in English about “The most useless bureaucratic process” contest, go here.